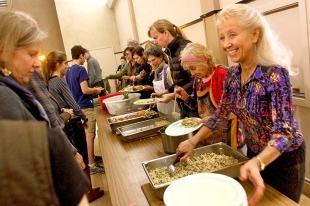 From right, Yana Mocak, Jane Kos, Jennifer Couperus, Judy Serebrin and other volunteers from the Peninsula Macrobiotic Community serve Thanksgiving dinner on Nov. 23, 2015. Photo by Veronica Weber. With the ethereal sounds of a young all-female a capella choir caroling in the background, families, couples, singles and seniors ate a rainbow selection of Thanksgiving-themed vegan dishes hosted by the Peninsula Macrobiotic Community on Monday. At each weekly Meat-Free Monday soiree, the nonprofit organization aims to educate the community about living a healthy lifestyle in a lighthearted and social atmosphere at the First Baptist Church in Palo Alto. When Patricia Joy Becker isn’t busy teaching yoga classes or testing vegan recipes for her website, she coordinates the organization’s events, organizes the marketing for the group and assists the team in serving dinner. At each event, she can be seen warmly greeting each guest, giving hugs to the event’s regulars, scooping sauces from beach-ball sized bins onto the plates of hungry patrons or even introducing singles to one another in hopes of forming friendships. As a maven of the macrobiotic lifestyle for more than 30 years, she noted that these dinners have become the highlight of her week. Inspired by her own road to better health since switching to a macrobiotic lifestyle, Patricia also offers nutrition counseling, along with meal ideas, tools and tricks for newbies to meat-free living. Although a balance of flavors is the winning combination to any extravagant meal, she summarized that a flavorful sauce is the No. 1 crucial trick when formulating a satisfying vegan or vegetarian meal. This notion informs each menu item created and served by the organization. There is no shortage of flavor at these dinners. The recipes are built around season-appropriate produce, and accentuated with the flavors of mushrooms, caramelized onions, sea vegetables or tamari sauce. Umboshi, or the savory fifth taste, is a key factor in these meals, because it lends an unctuous, rich “meaty” flavor without actually having to add any meat derivatives. The proof was in the sound of spoons scraping across the bottoms of bowls.